Janner and his family hope to find refuge in the last safe place in the world: the Green Hollows–a land of warriors feared even by Fangs of Dang. But there’s a big problem. Janner’s little brother-heir to the throne of Anniera-has grown a tail. And gray fur. Not to mention two pointed ears and long, dangerous fangs. 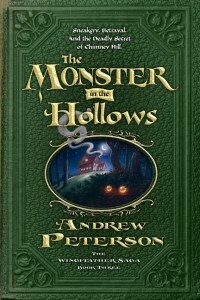 To the suspicious folk of the Green Hollows he looks like a monster. But Janner knows better. His brother isn’t as scary as he looks. He’s perfectly harmless. Join the Wingfeathers on an adventure filled with mystery, betrayal, and sneakery in a land of tasty fruits. There’s a monster on the loose and the truth lurks in the shadows. Book Three of The Wingfeather Saga fantasy series, for all ages.